Short roots can’t hold the soil in place, let alone do their job of feeding soil microorganisms, creating a sponge to hold water, and pulling carbon from the air deep, deep into the soil where it can be sequestered. This article from On Pasture magazine explains it all, with great photos of amazing grass roots. Though it’s written about grazing, the facts are true for mowing grass along our bayous and streams. Yes, even in parks. Graphic from On Pasture magazine. 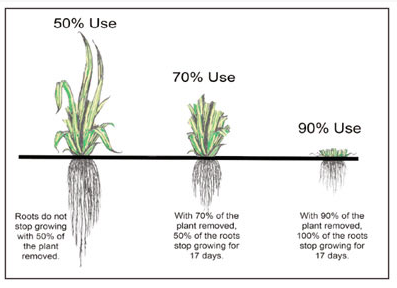 If you go to enough workshops about grazing, you’re bound to see an illustration that shows how biting off the tops of plants impacts their roots, and how if you graze short enough the plants won’t have enough roots to rebound and produce more leafy material. Read the rest of this article in On Pasture.